Today, I'm excited to share a fine motor skills book written by a fellow Occupational Therapist. Fine Motor ABC is a book full of alphabet themed activities that are designed to strengthen fine motor skills that are needed for functional tasks such as handwriting. 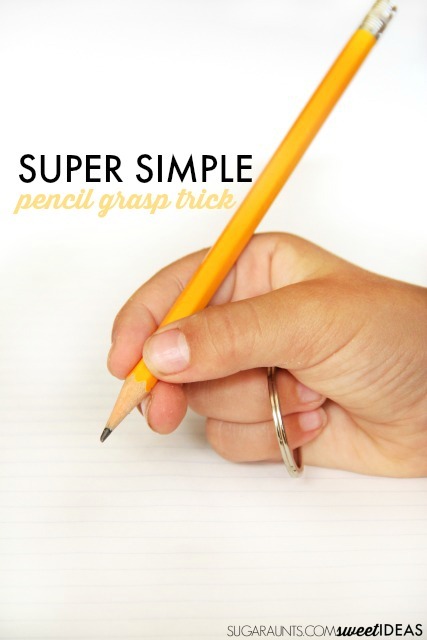 We tried one of the activities and found a great way to encourage a tripod grasp on the pencil when writing with this super simple pencil grasp trick. This would be a great addition to our post on creative ways to improve pencil grasp with fine motor skills. 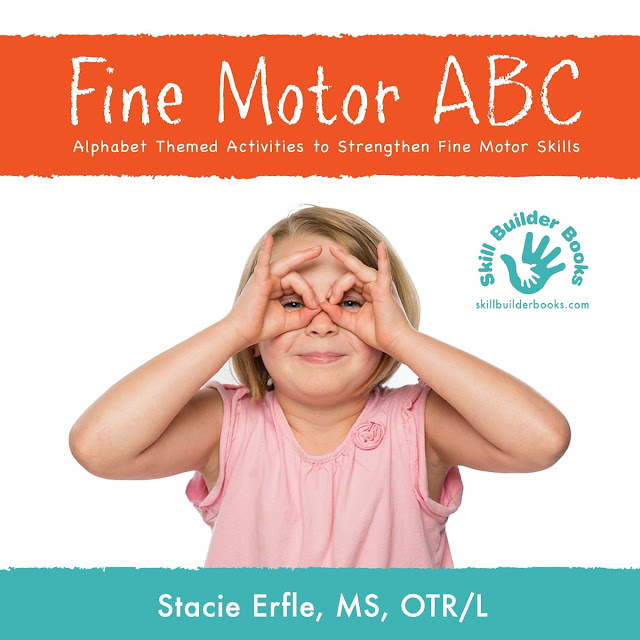 Fine Motor ABC is a great book for Occupational Therapists, teachers, and parents or anyone who works with kids. This book is a resource of engaging activities that are designed to target the necessary skills needed for childhood functional tasks. Each letter of the alphabet addresses a fine motor skill with a quick and easy description of the task. There are big, bright images and corresponding hand signs for kids to copy. The engaging description of the activities really had my kids interested in reading through the book. Following each lettered fine motor activity are through descriptions of the therapeutic reasoning for completing the task. 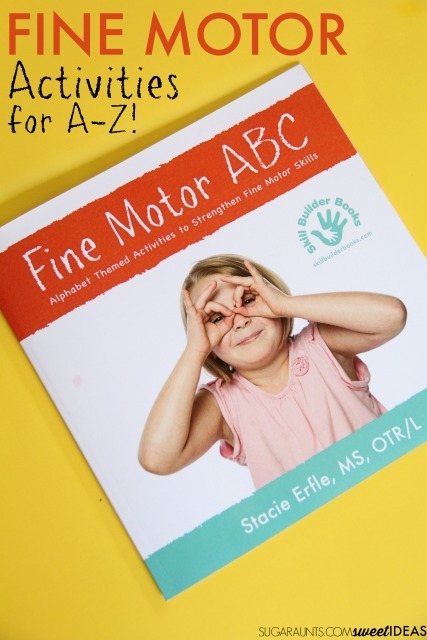 Fine Motor ABC is a book that would be well-used in any home, classroom, or therapy clinic. Stacie Erfle is an Occupational Therapist who has put creative ideas to work in her book and I'm excited to read the upcoming books on gross motor skills and sensory activities. Read more about the books on the Skill Builder site. Use the alphabet-themed fine motor activities in order from A-Z. Complete only a few of the letters, by spelling a word and completing those corresponding fine motor activities. Spell out the child's name by completing the fine motor activities that correspond with the letters in the child's name. Follow the sign language images at the top of each page. Ask the child to copy the hand signs. Don't forget to ask the child to carefully turn the pages of the book to see the next sign! Create a customized therapy home program using the themed fine motor tasks. Act out the activities without using manipulatives for a different way to practice the fine motor skills. Work through the book by doing the activities that have a purple border (or blue or orange border!) Next time do a different color. There are so many ways to use this resource activity book with kids! One of my favorite ideas from Fine Motor ABC is this super simple tripod grasp idea. We tried a version using a keychain keyring loop to work on encouraging a tripod grasp. 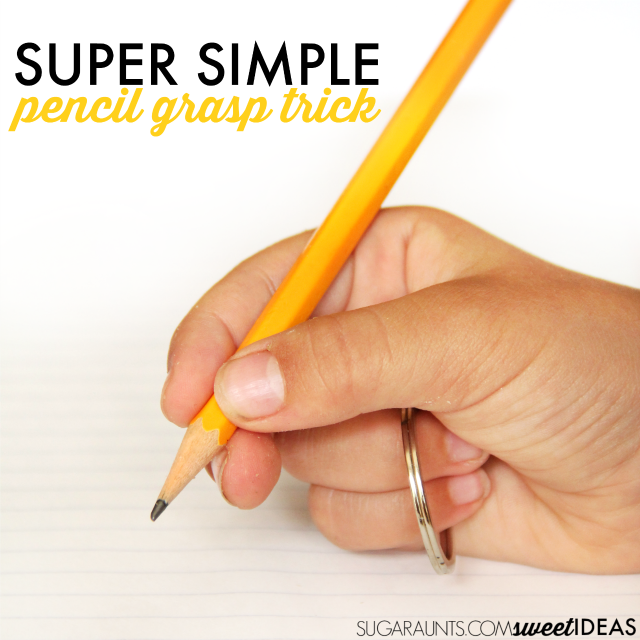 What a simple pencil grasp trick! Using the keyring loop is a fantastic way to separate the two sides of the hand with a tactile cue. To use the tool, simply shoe kids how to position the loop right over the ring finger and pinky finger. They can then tuck the keyring loop over the fingers or simply hold it in place in their palm. This tactile cue allows them to curve their fingers into the palm while stabilizing the ulnar side of the hand. 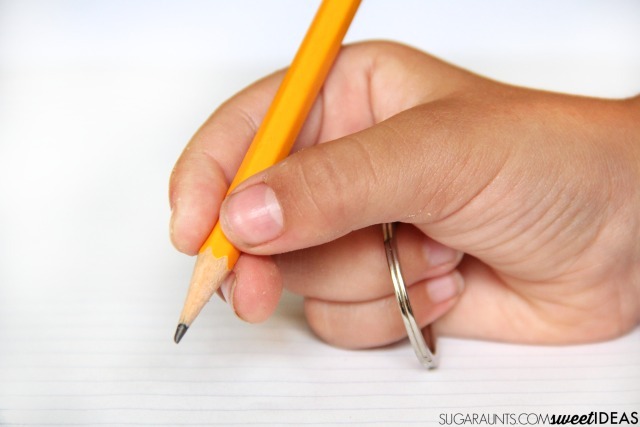 The middle finger, index finger, and thumb are then free to manipulate the pencil with the precision side of the hand.